Inquiring minds and all that you know, but one afternoon we were idling away the time when it suddenly popped into our head. Does an LCD monitor use more electricity when it is displaying all white or when it is displaying all black? Yes, that is what popped into our heads and thus was born the mini-quest for knowledge. You may think it is obvious that a monitor must use more electricity when it is all white, but you have to remember, these monitors aren't your grandfather's monitors. We aren't talking about cathode ray tubes which turn on the electron beam (use electricity) when painting a portion of the screen that isn't the background color and turns it off when painting a portion of the screen that IS the background color. LCD monitors have a backlight that is always on and then little gremlins, thousands and thousands of little gremlins who live inside your monitor, open and close little light faucets that allow the backlight to shine through or not. So, maybe these little gremlins need more electricity when the valves are open or closed or who knows what? So, off we went to Google on a quest to answer this question. And as usual, we found answers that indicated anything you want to believe. So as a result, we chose the answer that we wanted: LCD Monitors use less electricity when displaying a black screen than they do when displaying a white screen. Ok, we have a little bit of reason to think this might actually be the correct answer. We came across a search engine called "Blackle" which is located at www.blackle.com and purports to have saved over a billion watt-hours of electricity by having a black background on their pages. In support of their claim, the provide a link to this study by researchers at the Energy Analysis Department, Environmental Energy Technologies Division, Ernest Orlando Lawrence Berkeley National Laboratory at the University of California in Berkeley, California. And there on page 19, are the numbers. LCD monitors displaying a black screen use slightly less electricity than monitors displaying a white screen. So, how does this make The Naked Whiz web site green? Dude! All of our screens have black backgrounds. Geez, we must have save a billion watt-hours ourselves! So. Be green! Visit our webpage. Be annoying. Write to web sites with white backgrounds and tell them to switch to black. We'll save this planet one pixel at a a time! We are sort of working on a new secret project. This is a smaller secret project than the big secret project. The big secret project will probably resume in September. This small one should only take a day or two, so we hope to get it done soon. We have a new charcoal on the way. This one will take some time and effort since we will be comparing it to past incarnations of this charcoal. There will be extra tests and photos and writing it up will be a challenge, but it should be worth it. It's been a long time in coming and we look forward to finding out how this "new" charcoal does. People have asked where we stand on this recent explosion of controversy. Well frankly, we don't know but it is certainly something to behold. We don't compete on the BBQ circuit, just like when we flew a hot air balloon, we didn't compete in balloon rallies. We just don't like these sorts of competitions. 'nuff said. We have never joined the Kansas City Barbecue Society since we don't compete and we don't really see a reason to join otherwise. That said, we are certainly curious about what's going on in KCBS at the moment. A member of the board of directors has resigned over the behavior of another board member. The member who resigned is Rod Gray. The member who has caused all the grief is, well, we don't know who it is because apparently everyone associated with KCBS knows who this is and have known for some time who this is, but no one is allowed to name this BOD member for fear of slander accusations, apparently. As we are not "in the know" regarding all things KCBS, we don't know who this member is and certainly can't have an opinion on what's going on. We do find it curious that as a regular lurker on the KC BBQ Forum, we had never heard about the behavior of this board member until recent weeks. Now that Rod Gray, by resigning his seat on the BOD, has referred to the elephant in the room, everyone is now posting to The BBQ Forum about how this BOD member has tyrannized the board along with a long list of other objectionable behaviors. There are now calls for the removal of this BOD member and posts about Missouri law governing removal of BOD members from organizations. It truly is one of the most bizarre things we have ever seen. So, like we say, we have no opinion nor do we have any information that would help us form an opinion. For what it's worth, here is a link to Rod Gray's blog in which he details the reasons for his resignation: Pellet Envy Blog. Also, here is a link to a broadcast tonight on LA Talk Radio (Channel 1) in which Rod will be interviewed: LA Talk Radio. All we can say is that it should be interesting. We'll be listening. How about you? Leading the Green Revolution in BBQ? There will be another Operation BBQ event at Camp Lejeune in North Carolina coming up in July. The event is July 2-3 and volunteers are welcome. You can email us using the link at the bottom of every one of our web pages and we'll forward your name to the organizer. If you have never attended an Operation BBQ event before, the schedule goes something like this. We usually meet at the main gate at 11 am on July 2nd. We get situated at the site provided for the event and then we all sit around for a while wasting time and thinking about lunch. Around 5ish or so, the meat gets prepared and by 8 or so, the meat is in the cookers. The next morning, the pork is pulled, the brisket is sliced, the beans are heated and everything is made ready for the lunch at 11:30 or so. It is a great event: you get to meet young Marines serving our country; you get to talk barbecue; you get to eat barbecue. Sometimes you even get a tour of some of the Marine Corps' neat toys! So, email us if you are interested and we'll get you hooked up. Hope to see you at Camp Lejeune! CyberQ II review is up! 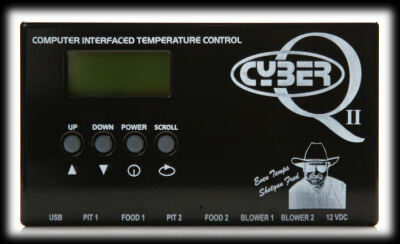 We have just posted (well, ok it was Friday) the review of the CyberQ II Temperature Controller from The BBQ Guru. (www.thebbqguru.com) The CyberQ II is the first offering from The BBQ Guru that has computer connection and dual cooker control. This is possibly our most in-depth review ever, so enjoy it!